Confession: I started this book and thought two things: 1) I like books that make me feel good about my Spanish and 2) this book is going to take a lot of brain power. I started this book for no other reason that I want to read more non-white authors and many readers I respect (who read the “literature” on top of just other stuff) rated this one highly. I also started it one day on the deck in the sun in my favorite reading spot. It is a stark contrast to all the YA lit I have been reading lately. 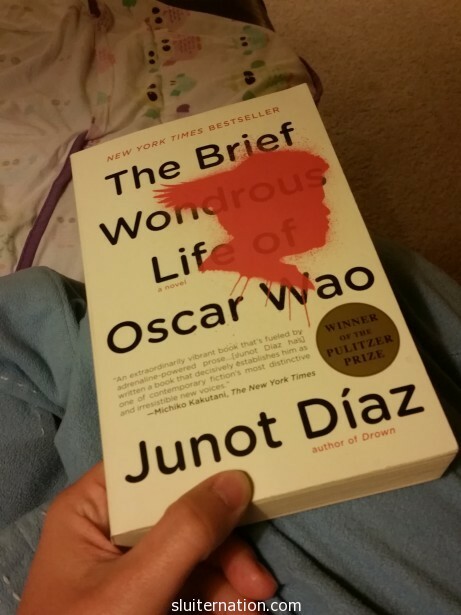 Let’s see…how do I describe Oscar Wao? Well, the book is fiction, but it also has some magical realism. The narrator is third person, seemingly omniscient, whose actual identity isn’t revealed until about halfway into the book. The story is about Oscar and the curse that is on him and his family called the fuku. The book starts with Oscar’s childhood, but talks about his mother’s childhood and formative years in the Dominican Republic, his maternal Grandfather (where the fuku started), and his sister, Lola. The narrator is incredibly conversational using Spanglish and Dominican slang to tell the story of the de Leon family.There are quite a few footnotes (which are just as conversational) to give the reader history and background of The Dominican Republic that will help understand character motivation or the environment the characters found themselves in. The book is beautiful. The writing is glorious and true and moving. I kept thinking of my students as I read it…how many have such journeys in their family history–maybe not with a curse attached–but who have parents who have come from another country and they are first generation in the US. About the struggles and the reasons for coming. It’s just an extraordinary book. I can’t compare it to anything because I have never read anything like it. And I read a lot.